Gentlemen! Here is an ultimate romantic anniversary gift for her! Gentlemen! Struggling to find unique wedding anniversary gifts? Your stressful search is over, thanks to Captured Wishes, with this memory making keepsake. Our beautiful and delicate Anniversary Wishes vessel is a delight to open and behold. Containing 'magic fairy dust', color-coded for lifelong happiness, it's sure to be well received by your better half. Ready to gift! 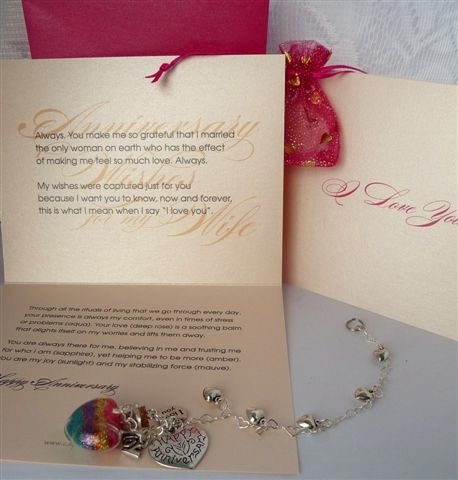 Personalize this by adding a heart for each year married! This beautiful Captured Wish (height approx 27mm x 22mm width) will help you to make a GREAT gift decision for this year's anniversary! Forget chocolates, flowers, perfume and all the other cliches. A Captured Wish is a simple expression of the words and feelings that men so often have difficulty demonstrating. This year, your wife will be truly grateful for your gesture! This Wish Vessel is worth its weight in gold for that reason alone. Comes complete in custom packaging, and with a suction-cup hook for display in a window, to show off the colors to their maximum impact, and a color key and verse card. Our wishing vessels are assembled in Canada - our aim is to create the most unique product on the market today, and to that end we look far and wide for the perfect piece or component to finish each creation. The source of our suppliers range from different areas of the world (England, China, Switzerland, United States, India, to name a few). A product we offer today just may not be available the next time you visit our site. ...but we'll always have something exciting and new to surprise you. We also take extra care with our wishes, especially the charms that go with them - the pewter charms are given an extra protective coating of lacquer to ensure they continue to keep their sheen and magic glow for a long, long time.